This September at the University of California, Berkeley is going to be one for the history books, whether it will be just a footnote or have a chapter devoted to it remains to be seen. The conservatives and the alt-right are coming to the campus to speak. Among them Ben Shapiro, Ann Coulter, Milo Yiannopoulos and possibly former White House aide Steve Bannon. This is throwing red meat at hungry pit bulls. The Oakland-Berkeley area is the U.S. epicentre of black bloc anarchists and the Antifa. types of conservative and alt-right speakers that will be coming to the Berkeley campus. It should be noted that Christ was named to her new position by University of California President Janet Napolitano, the former head of the Department of Homeland Security. It is not clear how much back stage directing is being done by Napolitano but it certainly provides both sides with the post-event opportunity to claim it was all a DHS set up, if the narrative calls for such. He has already asked the university to cancel "controversial" speakers. 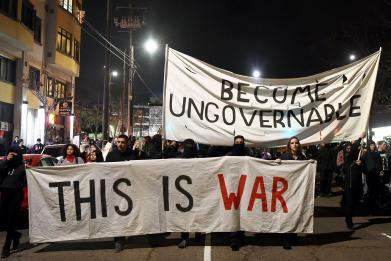 It is suspected that he may have played a role in what appeared to be the stand down of Berkeley police which allowed the black bloc and Antifa to go at the alt-right and Trump supporters in earlier skirmishes. And so Christ, backed by a former head of the DHS, is going to allow the speeches with a Berekely mayor who no doubt is sympathetic to the protesters that will appear. Berkeley school officials in the past have signalled how dangerous they have thought things could get. Christ, with an escape hatch, this is, of course, new. And when Mr. Yiannopoulos tried to speak on campus last February, Antifa activists threw Molotov cocktails, used commercial-grade fireworks as grenades, shattered windows and set fires, causing about $100,000 in damage. Yiannopoolous, Coulter and Bannon (if he shows) are scheduled to speak during a three-day event, September. 24-27. We have over 2,500 signups for Berkeley...and they are saying they're not going to release tickets until two days before the event, minimum. If you pay your tuition I guess you have the right to not learn anything. There is no higher learning in this country it has become higher stating.